Please remember that our next meeting is Tues, 22Jan at The Fiber Loft. Refreshments and social time will begin at 7pm. Our meeting will start promptly at 7:30. Amy Stevens will present “Blended Drafts”. See below for details! Blended drafts are a wonderful way to utilize an 8-shaft loom. Two 4-shaft drafts are combined to make a single 8-shaft draft that allows weaving either of the original 4-shaft drafts. It’s a technique that is particularly effective with overshot drafts, but there are lots of other possibilities for its use. Don’t have an 8-shaft loom? You’ll still walk away with a new perspective on drafting, and a couple examples of “blended” drafts using only 4 shafts. Handouts, including a bibliography from Kathy Tappan, will be provided. You are encouraged to bring along colored pencils or a computer drafting program on a pad or laptop (if you have one). Amy Stevens got started weaving in Boulder, Colorado, where she lived from 1980-1984. 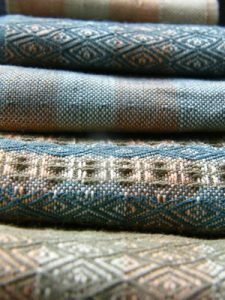 She has no problem with drafts and warping, but is working hard to develop fluency in weaving—the years since Boulder have included many years with no time to weave. Amy joined NVWG in 2014, and has been treasurer since 2016. She weaves on an 8-harness, 45-inch loom that she bought in Boulder in 1983—a Schacht, of course!